Speech pathologist, Staci Istre, works with her patient and caregiver in a special feeding room geared to meet our patient’s unique needs. Elite Therapy Center’s Elite Cafe Feeding Program provides trained therapists who specialize in pediatric feeding difficulties and associated diagnoses. 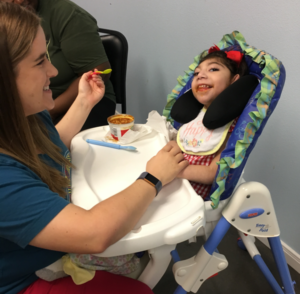 Our personalized program identifies feeding difficulties and determines the underlying cause (sensory, oral motor, behavioral, combination) by performing an initial evaluation and developing treatment goals that are appropriate to the child’s unique feeding needs. Identify the difference between oral motor deficits, sensory concerns and behavioral avoidance of feeding. Identify important information to gather during initial evaluation. Identify appropriate ways to write goals. Identify when to refer to another discipline. Ask for an evaluation with one of our trained therapists. Treatment is available at our Waco clinic.